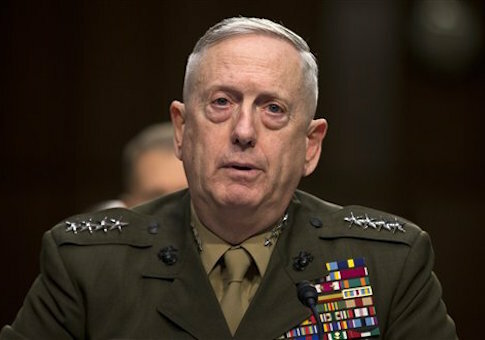 President-elect Donald Trump's reported selection of Gen. James Mattis as the next secretary of defense is sending shockwaves through the defense community, where insiders are praising the retired Marine Corps general as a plain spoken realist who has the leadership ability to rebuild America's military, according to conversations with multiple sources. While CNN and the Washington Post reported on Thursday that sources had said Mattis would be nominated, Trump communications director Jason Miller tweeted that a final decision had not yet been made. Donald Trump Jr., for his part, retweeted an article from the Hill that cited the Washington Post's report that Mattis would be nominated. Mattis, former commander of U.S. Central Command, is known for being outspoken about combat and America's need to reassert authority across the globe to challenge threats from extremism and radical rogue regimes. Trump's selection of Mattis follows those of Rep. Mike Pompeo (R., Kan.) as the next CIA director and retired Gen. Michael Flynn as national security adviser, picks that have won plaudits from observers and mark a clear ideological shift from the Obama administration. Foreign policy insiders and congressional sources told the Washington Free Beacon that Mattis has proven himself on the battlefield and earned respect among his peers. "Mattis is not someone who is going to prioritize wishful thinking over the reality of the world we face," said Michael Rubin, a former Pentagon adviser and expert on rogue regimes. Rubin said Mattis has the experience necessary to implement tough reform while keeping America's fighting force nimble and well equipped. "But it's not enough for the next defense secretary to face down our enemies. He must also face down the huge bloated bureaucracy which the Pentagon has become," Rubin said. "His predecessors have all taken the easy way out–enjoying the perks of office without carrying out substantive reform. The United States needs the most powerful military in the world capable of projecting force globally. It does not need the most bloated bureaucracy, capable of projecting powerpoints for hours a day." Michael Ledeen, a onetime consultant to the National Security Council and State and Defense Departments, as well as a former special adviser at the State Department, also had high praise for Mattis, who he described as a consummate Washington outsider. "He hates Washington, really hates it," Ledeen said, describing this as a positive trait for a defense secretary. "He's the best possible. The choices [by Trump] have been pretty good, I must say." The selection of Mattis also earned praise in Congress from Republican sources who work on foreign policy issues. "General Mattis is exactly the type of leader we need after eight years of failed leadership under President Obama," said one senior GOP aide. "He would serve our country well by reaffirming fractured alliances and pushing back against our enemies. I am encouraged to see President-elect Trump considering him to run the Pentagon." Another senior Republican Senate staffer who handles Middle East issues said that Mattis' extensive combat experience makes him a perfect fit for the role. "As a Marine, General Mattis served our nation honorably and fearlessly," the source said. "We should expect no less if Mattis, as a civilian, is now asked to serve as secretary of defense." Raheem Kassam, editor of Breitbart London and a Trump world insider, said that the selection of Mattis sends a positive sign to America's closest allies, including Britain. "Mattis is revered the world over," said Kassam, who had speculated about Mattis getting picked weeks before his name emerged in the running. "This is one appointment that even British liberal and conservatives agree upon. And frankly, it is about time America projected the ‘don't f— with us' attitude that he so well embodies." Update 5:30 P.M.: This post has been updated to clarify conflicting reports of Mattis's selection. This entry was posted in National Security and tagged Donald Trump, James Mattis. Bookmark the permalink.